Sheridan County, named for General Philip Sheridan, was organized by William Stevens; W. M. Rogers; W. C. Hausafus; and K. A. Ellithorpe, on June 2, 1880. Sheridan County contains the towns of Hoxie and Selden. 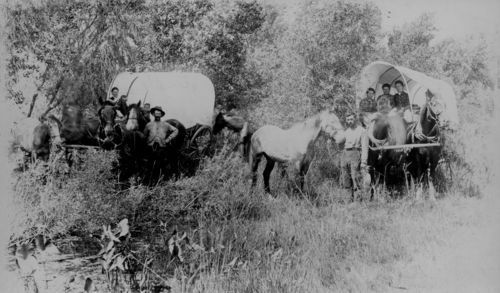 Local legends in Sheridan County states that Sam Morgan was believed to be the earliest settler in the county, and is said to have hunted buffalo with Buffalo Bill Cody. Monty Dillon, a shell-shocked or "just born that way" recluse of the county was returning from his service in World War I when a motor broke down on his transport. He repaired the motor from odds and ends and the ship was able to reach the United States. Legend has it that the rest of his life he remained a recluse, lived on dog, and seldom shaved or bathed. It is also said that the story concerning the ship was written in an old edition of an encyclopedia but no one can locate the story. The moving of the town of Kenneth to Hoxie and the subsequent change of the county seat to Hoxie because of the move of the two towns allowed an increase in population neces sary to have a county seat. Later in 1888, the coming of the Union Pacific Railroad further boosted the population. In 1896 the courthouse burned and most of the county records were destroyed. The first organized church was the Hoxie Presbyterian established on June 6, 1886. The first county fair may have been held in 1906. An agricultural exhibit was held in 1905. The present-day fair was organized officially in the 1950s. The first school was Sheridan Number 1 in Sheridan Township, organized in 1884. Two interesting public figures hail from Sheridan county. Erastus J. Turner was a member of Congress (1887-1891) from the county. Also Alex Fromme was born and raised in Sheridan County. He practiced law for many years in Hoxie before being appointed to the Kansas Supreme Court (1966-1982). Sheridan is home to many interesting sites such as the Cottonwood Ranch, State Historic Site, the Selden Hotel, and the Courthouse at Hoxie. For more information see the Sheridan County website. The Sheridan County Historical Society has some research materials. County records, dating from after the 1896 fire, are located in the courthouse. The Sheridan County Historical Society has some research materials. County records, dating from after the 1896 fire, are located in the courthouse. This information came from the County History Project completed in 1987 as part of the state's 125th anniversary of statehood. The project worked with individual counties around the state to record brief county histories.